Domestic and international markets, government policy and central bank decisions present opportunities, challenges and threats to the operating and competitive decisions of business owners, managers and investors. This class provides a framework for the economic analysis of these issues. This course introduces the principles and practices used to process and communicate financial information about an organization to various stakeholders. One element of the course relates to financial statements for external reporting, providing students with the foundation for the subsequent course in financial statement analysis. A second critical element of the course provides focus on appropriate information to support internal information needs. Information must be provided to support performance analysis, decision-making, and provide a framework for effective planning and control of the organization’s operations. This is an introductory course in quantitative methods with emphasis on business applications. Throughout this class an emphasis is placed on helping the student to recognize situations and areas in business in which quantitative analysis might be useful. Financial Management provides a comprehensive framework for analyzing and understanding the financial issues faced by finance professionals in the corporate, financial and capital markets sectors. The course emphasizes a blend of the theoretical and the practical and provides students with a basis for integrating financial concepts in other disciplines as well as advanced finance-related courses. The tools and techniques of finance are introduced along with the theory, but always with the end goal of implementation in the corporate, small business, institutional or investment settings. Marketing is the business function responsible for understanding the needs of consumers, suppliers and retailers and for creating value for these and other stakeholder groups. As such, it is more than a department within a firm—it is a function that must be undertaken on a company-wide basis. Marketing drives choices about what markets to serve and which needs to satisfy, about what partnerships and relationships to pursue, about product and service design, about prices that can be levied, and about the channels that can best be used for distribution and communication. The concepts presented in the course apply to businesses large and small as well as to not-for-profit organizations. This course offers an exploration of the theory and practice involved in working with people in organizations, from both formal and informal leadership perspectives. The emphasis is on understanding individual (micro) and organizational (macro) factors and the processes through which they influence behaviour, with a view to improving managerial effectiveness. Students have the opportunity to develop and apply this understanding through experiential exercises, case studies and assignments situated in real organizations. Operations management is the study of the processes used in the production of goods and services. In this course we examine the approaches used in the key areas of quality and inventory. Other topics such as forecasting are important in OM, but have a wider applicability. We make limited use of cases to illustrate processes and how the techniques are applied. 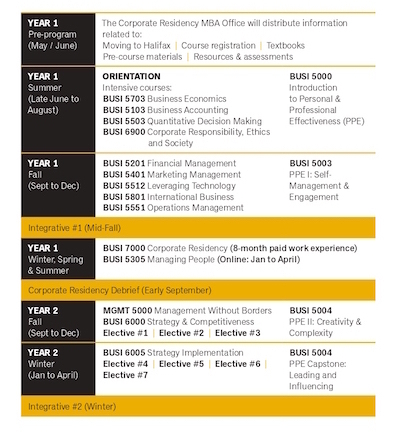 This course provides an introduction to international business. It builds on the economic foundations of trade and investment, and introduces students to global trade, finance and regulatory frameworks, and the relationships between international companies and nation-states. By the end of the course students will have developed an understanding of the nuances of the costs and benefits of foreign investments, the alternative controls and responses required for transnational trade, as well as the effects of local environmental characteristics on the operations of multinational enterprises. This class introduces students to the relevance and importance of ethics and social responsibility in business. The ultimate intent of the course is to leave students better equipped to identify, think critically about and resolve ethical issues that are encountered in one’s working life at the individual, organizational and societal levels. Developments in technology have enabled tremendous improvements not only to knowledge workers’ daily lives but also to organizations’ business processes, competitive position and strategic partnerships. This course examines how information technology is used in business to transform data to information and knowledge for strategic and competitive purposes. Topics covered include the foundations of information technology, knowledge management systems, decision support systems, e-business systems and IT strategy, as well as issues related to IT implementation, security, ethical and legal considerations. This class places management in its broadest context and helps students from diverse disciplines understand the complex social, economic, ecological, political and technological forces that affect individuals and organizations in the 21st century. Key themes and skills explored in the course include systems thinking, collaboration across sectoral boundaries, sustainable economic development, social (and green) enterprise development and personal/professional development. This class is about the general manager’s task of managing strategy in all types of organizations. The class develops concepts, frameworks, techniques, and skills that are foundational to the development and execution of strategies that are competitively sound, organizationally doable, and effective in guiding organizational decisions and actions. Strategy Implementation builds on Strategy and Competitiveness and other MBA courses by focusing on the implementation of strategies once they are developed. It is integrative, dealing with the organization as an integrated whole, from the perspective of the general manager. Specific topics include implementing strategy, strategy and organization, leadership, corporate culture, and the management of strategic change in organizations. Students are exposed to a wide variety of organizations through case studies and have the opportunity to examine a single organization in detail through their field consulting projects. Exclusions: Open to second-year students only. Download as a pdf [142 kB].